This month Bombay Brunch Brigade took a break from its usual drunkenness to accommodate Anish Kapoor’s first show in India. The Brigade met promptly on time at Mehboob Studios in Bandra. The studio set up by director – producer Mehboob Khan, with its brick walls, high ceilings and rustic charm made for a perfect setting for the show. Kapoor’s polished and pristine, mirrored and stainless steel works are very inclusive and involve the viewer almost immediately. His work is poetic and is composed of layers of meaning which has a direct or indirect effect on most individuals. Through his work Kapoor, fragments, distorts and quilts perceptions. The first piece of work on display titled S-Curve, reminds of Richard Serra’s work. Serra is known for his minimalist sculpture and use of large rolls and sheets of metal that are oxidized and the patina of the steel is left to settle over time. His work is easily identifiable for it’s scale. Both these sculptors explore form and volume but their choice of materials are diametrically different. Where Serra’s choice of material is unrefined and naked, Kapoor’s is polished and dressed. Serra’s work often leads the viewer along a path, envelopes, overwhelms and sometimes terrifies. Where as Kapoor’s work attracts and as one is about to lean in it repels and disorients. Both artists explore bodily and sensory relations in space. Another piece the non object spire, the base of which sits flushed to the ground out of which it appears to rise points to the roof as if being pulled by a thread and disappears to a peak no wider than a pinprick has been crafted with precision. His sculptural works are well planned and calculated. The other works on display vary in form and play with perception as they have in the past. Kapoor surprises his viewers with a performance like piece, Shooting Into the Corner. This piece is dramatic, it consists of a cannon that shoots pellets of deep red coloured wax on whitewashed walls. This piece is operated by an operator every twenty minutes. This piece engages the architecture of the space, displaying the process of painting and installation of a sculpture live. Attendants alert viewers a few minutes before the cannon is fired so that all present can view the performance but I feel that robs us of the impact and drama of the noise. I would much rather be caught unaware and surprised. With this non reflective piece Kapoor is making a statement that reflects the current violent political scenario around the world. The piece failed to have the intended impact on me and I personally was not repulsed but seduced by the rich colour of the deep red wax. This piece was not as refined and in stark contrast to his mirrored works. I would personally like to see Kapoor’s work installed in a public space in Bombay and see the impact and how it engages the people of Bombay. 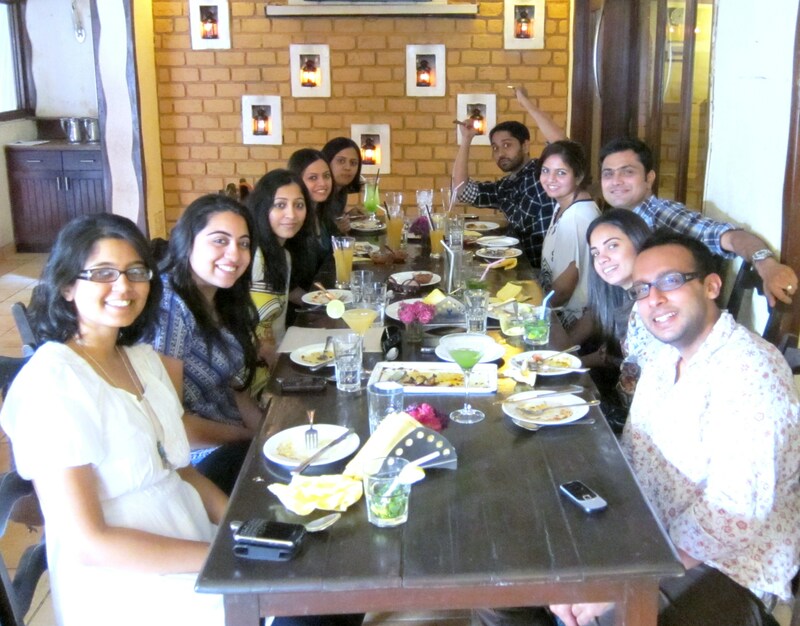 After our rendezvous with Kapoor we headed over to Cafe Goa. For a Sunday it was surprising to find the place empty, though we did not mind having the entire place to ourselves. This time instead of the usual prix fixe we decided to go in for the a la carte menu. It was more of a blunch than a brunch. We did not let ourselves go crazy and only a few of us indulged in alcohol. I had to try the Fenijto (Feni and Mojito) which I thought was just about ok. I then switched to a Mojito. A few others had Mojitos and Caiparijtos and the rest had coolers. We started off by ordering some Panjim potatoes that were evenly spiced. Then some prawn papads. I expected the papad to be wrapped around a prawn like a basket or a potli somosa but instead the prawn was minced and wrapped in a papad like a spring roll. It was just about ok and disappointing for a place that claims it to be a specialty. The papad was not as crispy which did not compliment the texture of the minced prawn. We followed it with some prawn tikkis. They were just about ok as well. Then we called for some tangy achari pareer, they were good and disappeared quickly. For main course placing the order was no less than an event. We were loud and if the place had other guests they would have found us to be obnoxious. We called for some veg goan curry, chicken cafreal that was delightful. It was a coconut milk based curry with fresh herbs and coriander. I would not mind going back for more. We also had some Goan sausage chilli fry that was nice and greasy with some poyee(fresh leavened goan bread). We also called for a spiced grilled pomfret. The ambience lacks charm and the food plain average with the cafreal being an exception. However I have heard that they have fantastic karaoke nights so may be we will come back for some karaoke some day. Our conversations ranged from architecture to our college life experiences and some of us reminisced about New York. We certainly missed our usual drunken brunch and will definitely return to it next month. This entry was posted in Art, Food, Travel and tagged Anish Kapoor, Bandra, Bombay, Brunch, Cafe Goa, Culture, Food, Installation, Mehboob Studios, Mumbai, Richard Serra. Bookmark the permalink. 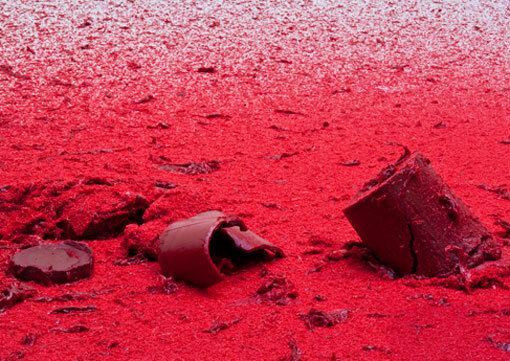 Great Post Jasem, especially like the Anish Kapoor crit ! !